I’ve been a member of The Funding Network now for the last few years and love the opportunity to hear from people I don’t know speak about causes that I have usually not heard of, and then having the privilege to contribute to raising money to help them keep moving their cause along. If you aren’t familiar with TFN, the basics are that you go along to an event, usually hosted in a corporate city office, where there are some pre-event drinks and formalities followed by 4 charities who get to present their story in an effort to raise $10k to take their project/ cause to the next level. Each charity has been coached to present a great 6-minute pitch (think TedX style) on who they are, what they do and how they impact improving the community in some way. The audience then has 6 minutes for questions. Once all 4 have finished presenting, they leave the room and a live donation process is held. The goal is to raise a minimum of $10k for each charity, but honestly, I’ve never been to one of these events where a lot more than that wasn’t achieved. Whilst I’m a regular at TFN, this time for me, it was a special occasion. 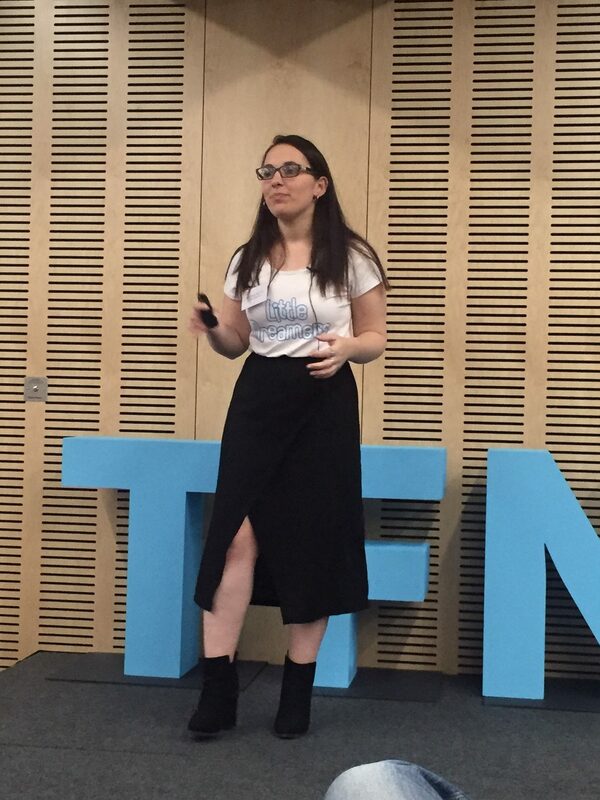 The function was a dual effort between TFN and FYA (Foundation for Young Australians) and so all the speakers were young Aussies who were trying to develop their philanthropic idea further. My 21-year-old cousin was visiting Australia for the first time as an adult, having just graduated from Cambridge in the UK (super smart cookie with worldly interests) and given we had already taken her to all the Sydney glamour spots, I thought it would also be great for her to see what community challenges we have so she could see both sides of the fence. Boy was she impressed. The presenters blew us away and on the night, the power of one inspired room, generated $96k in total for these 4 causes. First up we had Human Kind Enterprises. Sophie and Anna were two passionate and inspiring girls who had joined forces to create ‘StoryPod’ – a way to connect young Australians and senior citizens with the goal of improving social health and resilience. This story telling initiatives develops new skills and reduces barriers for the senior people to engage in their local community. They were seeking funding for a 6-week program to employ young jobseekers who will share technology skills with seniors and capture stories that can be shared with younger generations. In total, these girls raised over $22k to get their idea off the ground. Next up we had Madelaine Buchner from Little Dreamers. What a pocket rocket of amazingness she was. Madelaine herself is a young carer, and works with people under 25 years of age who care for a family member with a long term illness or disability. Madelaine highlighted that we have 460,000 young carers in Australia who don’t get much support for their emotional and physical health and resilience and that she had set up this organisation to make sure that caring is a responsibility shared by government, community and family. I can’t deny it, I cried hearing her story and was thrilled when her total donation reached $26,500 so that could launch and grow her Dream Coaching Platform, which is an online support group for young carers including a forum, inspirational stories and a directory of services. Third was a young indigenous girl named Millie Telford from Seed whose relationship with her cultural heritage had inspired her to launch the first indigenous youth led climate network, building a movement of Aboriginal and Torres Strait Islander people for climate justice. Millie’s passion shone through her outlining her vision of creating a just and sustainable future with strong cultures and communities, powered by renewable energy. At the end Millie was given just over $21k to fund their first-ever schools program in Victoria to provide workshops for 200 Indigenous students in 10 high schools who wanted to participate in driving Seed’s mission. Lastly was a fantastic presenter by the name of Rosie Thomas who started Project Rockit with her sister after graduating from school. You could see this girl knew how to rally a crowd and get people behind her. Project Rockit is Australia’s youth-driven movement against (cyber) bullying, hate and prejudice (I wish I had been able to access this when I was at school). They have existed for 10 years delivering high impact face-to-face and online workshops to hundreds of thousands of young people. They raised $26,150 (and got a meeting with an executive from the NBN who was in the audience) to fund a new online platform created by young people for young people, to ensure youth in regional and rural communities can access the same support as their metropolitan peers. $96k in a night – woah. Apart from the feel good factor of giving, the best thing for Rainbow Jane is that both Madelaine and Rosie have agreed to be part of our #inspiredkindness project and I can’t wait to sit down with them in person for an interview and tell their story to as many people as we can, so they can get more support to take their causes forward.